Quintessentially British design and exquisite craftsmanship combine with the vintage-inspired Emmy London collection. This sparkling 1/4 carat diamond solitaire in 9ct white gold features a luxurious diamond halo, baguette cut diamond set shoulders, and a secret diamond inside the band. 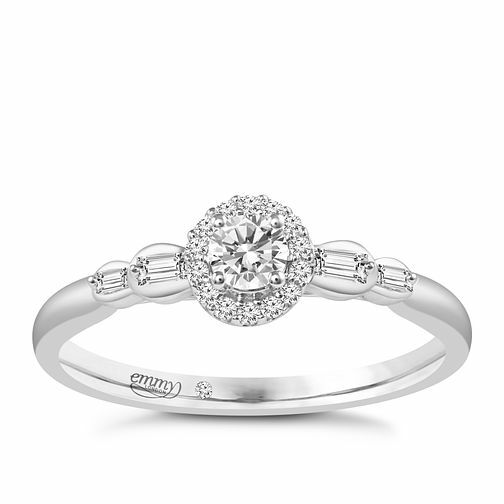 Featuring I1 certified diamonds and an independent GSI certificate. Emmy London 9ct White Gold 1/4 Carat Diamond Halo Ring is rated 5.0 out of 5 by 3. Rated 5 out of 5 by Anonymous from So in love I absolutely love my new engagement ring! It's absolutely perfect and nearly every single person I've shown it to has said how stunning and unusual it is! I love the vintage art Deco vibe, its modern and timeless! Rated 5 out of 5 by Anonymous from So elegant Greay design and delicate details. A perfect fit for my slim fingers. Would especially recommend for petite girls, as ring is not big. A lot of sparkle though! I got so many complements about it.